Beistle 00912 Stairway, Window and Torch Props. The package includes 9 different designs of props. 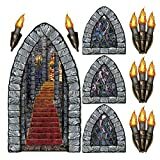 The designs include a stairway, windows and torches. They are printed on thin clear plastic. The props range in size from 18 inches to 60 inches. Props are not free-standing. They are printed on thin plastic material to be cut apart and attached to walls. Great to go along with the plastic backdrops.